When it comes to crafting with glitter, one of the very best, go-to lines is the Martha Stewart collection. When you're crafting with EK Success Brands' Martha Stewart glitter, you're covered. Every crafter searches for a type of glitter that is easy to work with, and still has a great sparkle and hue. This is what you will find when you use this Martha Stewart Glitter Set, it is versatile and easy to manipulate. 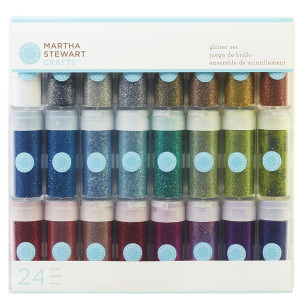 The Martha Stewart Glitter set contains 24 vials of extra fine glitter, which all come in a different color. These bright and cheerful tones will give any project you're working some extra glitz and glam. Add some sparkle and shine to your life with this high-quality glitter. This particular Martha Stewart Glitter Set is called the Rich Essentials Kit. The colors that are featured in this kit are an assortment of bright and vibrant hues. One of the best things about this slitter kit is its versatility, you could honestly use it to decorate any project that you can imagine. When your glitter is as easy to work with as this Martha Stewart Glitter Set, the craft possibilities are endless. From dark and light blues, purples, and greens to florescent and bold whites, silvers, and golds, each color is perfect for a different occasion or project. 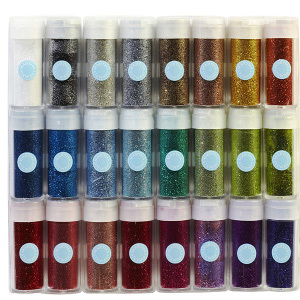 Including 24 different colored glitter vials, this set will keep your glitter stash full and varied for quite some time. The glitter is ultra-fine and offers a lot of light reflection, making it shimmer and shine more than other glitters similar to it. With this high-quality glitter set, crafting with fine glitter has never been easier. The color and quality of the glitter you will receive in the Martha Stewart Glitter Set is not only impressive, but also simple to work with. Win a Holiday Ribbon Assortment!